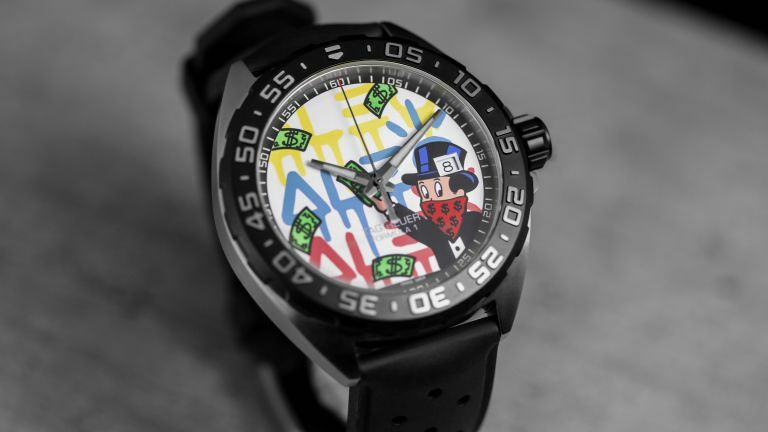 The two latest models in TAG Heuer’s range are an extension of the creative collaboration between the watch brand and Alec Monopoly, combining watchmaking craftsmanship and contemporary art. The two first came together in 2016 when the artist was announced as the Swiss watchmaker’s Art Provocateur at Miami Contemporary Art Week. On that occasion, Alec Monopoly tagged the TAG Heuer boutique in the Miami Design District. No, Alec Monopoly, is at it again. Original and colourful, these TAG Heuer Formula 1 and Carrera models feature the little banker called Monopi wearing a red bandana over his face and throwing cash across the dial. Alec Monopoly’s instantly recognisable signature is found in the background in yellow, blue and red. The 41mm Formula 1 model is presented on a black rubber strap. The sporty watch features a stainless- steel unidirectional bezel with a black PVD coating that is engraved with a 60-minute scale. The watch’s bold black design is the perfect backdrop for the bright artwork on the dial to truly stand out. This stylish 43mm chronograph features a case and lugs in brushed stainless steel and is presented on an H-shaped stainless-steel bracelet with an alternating brushed and polished finish. The fixed bezel, with its iconic tachymeter scale, is made from black ceramic.